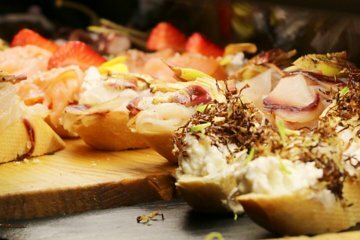 Scopri cosa offre la cucina veneziana a parte il resto d'Italia in un indulgente tour enogastronomico a Venezia. Bere prosecco a colazione, scoprire gli amati piccoli morsi conosciuti come "cicchetti", cacciare il miglior gelato della città e fare un salto in alcuni dei migliori "bacari" o enoteche dell'isola, in un viaggio sensoriale guidato da una guida culinaria. Completa deliziose degustazioni con un abbondante pranzo a base di pasta e un breve giro in gondola attraverso il Canal Grande per un'autentica esperienza veneziana. Since no one else signed up for the tour date that we selected, my husband and I wound up getting a private walking food tour! It was very easy to find our meeting location and the guide had a clear sign. The food was phenomenal and our guide was a true Venetian and had so much insight into the city and how much it's changed over time. She was accommodating to my vegetarian food restrictions and helped us pick authentic cuisine to try from several different restaurants. I would highly recommend this tour to anyone looking for authentic cuisine - you'll end up very full, but the food is simply divine and the perspective we were able to gain from talking to our guide was just incredible! This was by far our favorite excursion of the 7 excursion items we had booked for our trip. This was our second time in Venice so we were looking for something a bit different this time around. We did this tour and it was fantastic. Our guides were great. The weather was a bit rainy and cold, but that didn't stop us from having a good time. We got to see some nice local locations and have some great food. We learned a lot about Venice and the daily life of a Venetian, which was quite nice. I would probably do this tour again since the locations may be switched up from time to time. Even if they weren't, it was a nice enough experience that I would repeat it. This tour was great - really informative not just about Venetian food but also the history and culture. The food itself was excellent and was great to get a small gondola ride as well! I highly recommend this to everyone visiting Venice. The tour was really good. Gives you a quick/fun view of the Rialto Bridge surroundings. The tour guide was amazing! A Venice local with tons on insight.